Castle Combe’s natural oil process provides a warmth and refinement to the floor that cannot be achieved with modern day acrylic or polyurethane coatings. The rich patina of each Castle Combe floor is only enhanced with age and use - the more it is walked on, the more beautiful it gets. The natural oils in Castle Combe floors penetrate the grain and become part of the floor, while the surface film of acrylic and polyurethane detracts from the natural beauty of hardwood and degrades with age and use. 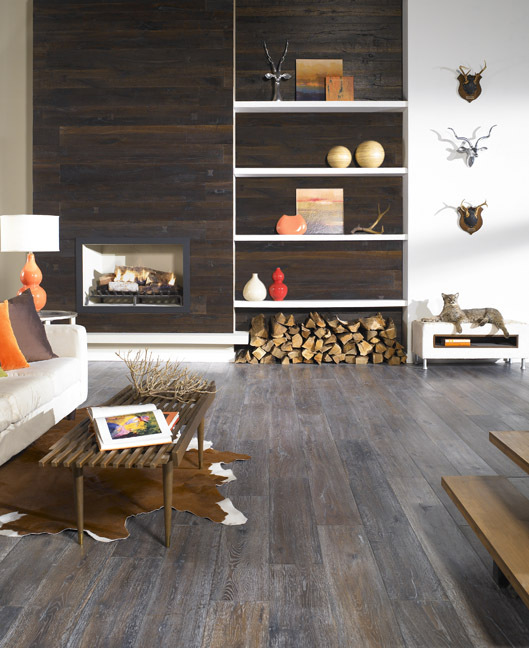 Castle Combe floors feature a distinctive and sophisticated range of distressed, sculpted, and antiqued visuals. Each Castle Combe floor is meticulously crafted to ensure lasting beauty for generations to come. A solid oak hardwood top layer rests on a multi-layered, dimensionally stable core giving each Castle Combe floor the strength to withstand decades of use.